For a year in 1985 I was the singer for this wonderful friend and phenomenal trombonist and her band, who were signed to Virgin Records. We played dates opposite Max Roach, Jan Garbarek and Stefan Grappelli, touring across India for JazzYatra in 1986. I had to leave when put in the difficult situation of choosing between a European Tour with Annie and a World Tour for The Communards. 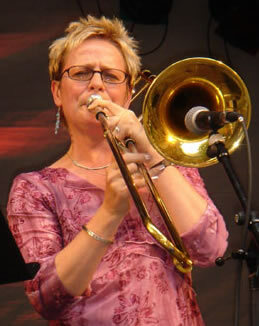 The Annie Whitehead-led project Soup Songs, involves some of England’s best jazz musicians playing the music of Robert Wyatt. The line-up is: Cristina Donna (the fabulous, quirky Italian singer), Jennifer Maidman and myself on lead vocals (Jennifer is also the guitarist), Annie on trombone, Mark Lockhart on saxes, Harry Beckett (a legend in his own lifetime) on trumpet, Dudley Philips on double and electric bass, Steve Lodder on piano and keyboards, and Liam Genocky on drums and personality (this guy is amazing!). This is definitely one to track down, as it is one of my favourite musical experiences. The songs are uniquely quirky, English, political and written by one of our best songwriters. The arrangements by Annie Whitehead are sublime!